The heat was certainly on when I ventured to the Prince Edward Theatre to see the much anticipated Miss Saigon. I LOVE the location of this theatre, nestled within the inner belly of kitsch Soho. On this particular evening it was lovely to have an alfresco pre show cider at one of the adjacent bars whilst watching the excitement build around the theatre. There is a buzz about this show and the second I took my seat in the Stalls it became clear why; a national treasure has come home. Claude-Michel Schönberg and Alain Boubil just do it for me. They are the unrivalled champions of music and lyrics and this is oh so evident in the timeless score and emotive words of Miss Saigon. They had me, from start to finish and often in tears. Live renditions of “Sun and Moon” “The Morning of The Dragon” and “Maybe” took my breath away. As expected, the revival cast were impeccable. I had the pleasure of watching alternate Kim, Tanya Manalang, alongside Alistair Brammer as Chris. Both were impossibly wonderful, especially Manalang who had me hanging on her every movement. Manalang’s most accomplished moments of pain and passion were in her encounter with Thuy at the end of Act 1 (“You Will Not Touch Him”) and with Chris’s wife Ellen in Act 2 (“Room 317.”) I do hope this rising star is given more chances to fulfil the role. “Now That I’ve Seen Her”) gave the show a new level of depth. On top of strong leading performances, all of the ensemble were similarly tight and pitch perfect. 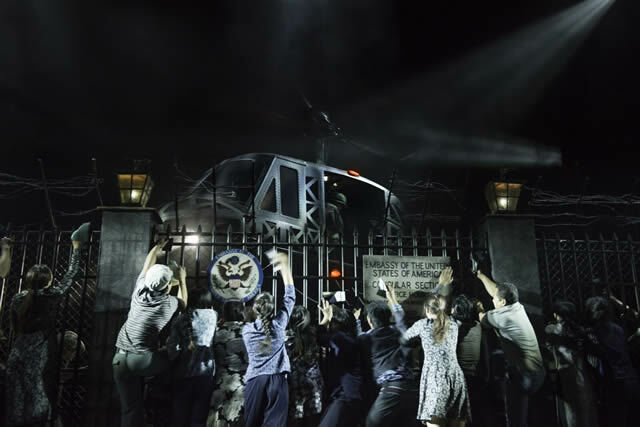 I was fully engaged with Miss Saigon, however there were still a few small issues for me. One was the set, which doesn’t seem to have been adapted too much since 1989. Whilst I very much enjoyed the Asian settings (having been to Bangkok, scenes here were pretty spot on) however I felt little thought was given to establishing a realistic American backdrop. If you can get a helicopter on stage, surely the US can be represented by something a bit more realistic than a painted skyline? My second small issue was the placement of The Engineers’ song “The American Dream” in Act Two. If Boubil and Schönberg are still willing to pen new material, I’d say this needs a re-think. It comes after many key revelations that build to the pinnacle of the show and follows on from Ellen’s highly charged “Maybe.” At this point in the narrative, I don’t really care for his dream; I want to see what will happen with the ill fated love triangle. Overall I sat and watched the show with the continuing feeling of “this is how theatre should be done.” This production tugged at my heart strings in a way that only one other West End show (War Horse) has managed. I was in awe of the actors, who showed incredible talent and I really feel this revival, save a few small issues, is one of the best shows on the West End at the moment.